Herbert Welbourn is one of the men named on the Bottesford ‘church list’ of WW1 Servicemen. Herbert Welbourn, born in 1888, was Australian by birth. He was second son of William Welbourn, born in 1857 at Thirsk, Yorkshire, in 1856, and Amelie Sussbier, born 1859, from Tanunda, Southern Australia. Their children were William, Herbert, Myrtle, Beatrice and Harold. The family returned to England in August, 1899, aboard the “Gera”, which sailed from Sydney to Southampton via Melbourne, Adelaide and Colombo. In 1901, they had settled into a house at the northern end of Queen Street, opposite to Samuel Winn’s shop. Mr Welbourn was a watchmaker, William employed as a commercial clerk, and Herbert was a butcher’s apprentice. The Census of 1901 also records that Edward Welbourn, a 68 years old retired watchmaker born in Bottesford. He lived on Belvoir Road with his wife Anne, 54, from Mold in Flintshire, and their 18 year old grand-daughter, Annie Welbourn, who was born in Pontefract, Yorkshire. It seems probable that William and Edward Welbourn were related. Edward may have been William’s uncle. The 1911 Census records that at 1 Albert Street lived Drusella Morgan, a 67 years old widow from Carmarthen, with her adopted daughter Jessie Welbourn, aged 23, from Cefn Coed, Breconshire, and son-in-law (Jessie’s husband) Herbert Welbourn, also aged 23, a book-keeper born in Jamestown, South Australia. Herbert and Annie Thomas had married on the 23rd February, 1911. Herbert’s older brother, Harold Welbourn was an apprentice baker living nearby with his widowed mother Emilie at 7, Chapel Street. He joined the Royal Navy as ABS J15373 and served on HMS Blenheim for much of the war. Herbert Welbourn became the churchwarden at St Mary’s before he became a cavalryman in WW1. Herbert Welbourn was 674 Private in the King Edward’s Horse. He probably joined up early in the war, or may have been a part-time reservist before the war began. Unfortunately, the information does not indicate which of the three Squadrons of the regiment he was in, but it is likely that he was involved in many actions through the war. The regiment was part of the Special Reserve and was mobilized immediately for war service. It then fought in France and Italy, being specially remembered for its defence of Huit Maisons and Vieille Chapelle in April 1918 at the start of the Battle of the Lys (Long Long Trail website). Herbert was promoted to Sergeant. On the 23rd January 1919 the Grantham Journal reported: “Demobilized – Sgt. 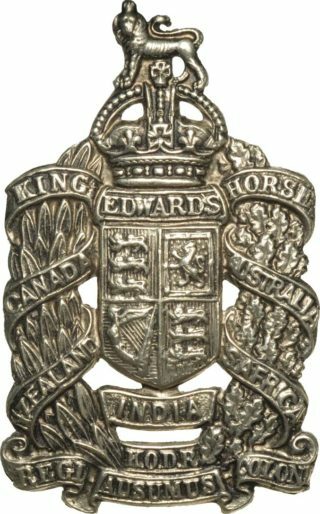 Herbert Welbourn, of King Edward’s Horse, has been demobilized, and has returned home this week. During his absence from Bottesford, his duties as Rector’s Churchwarden have been carried out by Mr R.J. Marriott. …”. Herbert resumed his duties as the Rector’s Churchwarden, as reported by the Grantham Journal in 1920. Herbert and Jessie lived on Queen Street after his return, and remained there through the 1930s. In the 1939 register their entry records them on Queen Street: Herbert Welbourn, solicitor’s clerk born on the 6th April 1887, and Jessie Welbourn, born 21st November 1887. He served as Clerk to Bottesford Parish Council for many years. They did not have any children. Herbert Welbourn’s father died in 1936 in South Africa, aged 79, and his mother died at Mickleover, Derbyshire, in 1944, aged 86. Herbert and Jessie died in the same year, 1956, and were buried in St Mary’s churchyard. Herbert died on the 6th February, aged 69. Jessie died was buried at Bottesford on the May 28th.